Werner Widuckel (born in 1958) studied social sciences at the University of Göttingen, graduating in 1984. After a short period as a research associate at the Seminar for Sociology, he moved to Volkswagen AG He completed his doctoral degree in sociology at Technische Universität Braunschweig on ‘Paradigm developments in worker co-determination at Volkswagen’ in 2003. 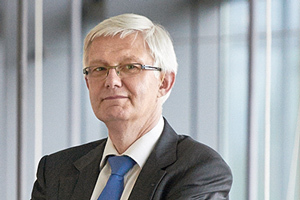 He held various roles as a member of the group and company works councils until 2005 before becoming head of co-ordination in the human resources management department at Audi AG. After a short period as head of human resources policy and fundamental issues, he became a member of the board of management as head of human resources and labour relations at Audi AG in December 2005. He was a visiting professor of human resources and organization at Heilbronn University in 2010. He began teaching at Friedrich-Alexander-Universität Erlangen-Nürnberg (FAU) in 2011. His research focuses on management and participation, human resources management and organization, international human resources management, diversity, industrial relations and changes in work, paradigms of temporary employment, and digitization of work.